How does Paradise become Purgatory? When a vulnerable appetite is tempted to acts of Dantesque gluttony by an otherworldly array of food, that's how. Such was the diner's dilemma that I faced at the Shangri-La Hotel's breakfast buffet in Makati City, Philippines a few weeks ago. Oh, the food! As far as the eye could see (at least, to the far wall) was a display of chow so luxuriant that I was convinced I had indeed stumbled upon the namesake utopia of James Hilton's Lost Horizon. But as it turned out, a more appropriate literary analogy was Aligheiri's Divine Comedy: I had entered the infernal Circles, Shangri-la's 'theatre-kitchen' café, where enticing international breakfast fare mocked the pious yogurt-and-granola daily regimen of my non-vacation life. After the final plate was cleared, there wasn't a fig leaf large enough to cover my shameful gorging in this Garden of Eating. Circles' cornucopia offered everything from sushi and dim sum to parathas and pancakes. In a global journey along the buffet line, I giddily chose between Indian sambhar and idli, American bacon and eggs, and Filipino bangus and sinangag (garlic fried rice). It was a microcosm of breakfast traditions from different cultures that challenged patrons to reconsider what constitutes typical morning fare. Bowls of crunchy cereal and pitchers of cold milk stood alongside steaming pots of miso, arroz caldo and ramen noodle soups. For those who preferred more protein-y options, there were Weisswurst and longanisa sausages, corned beef hash, smoked salmon and eggs cooked to order, all of which were equally enjoyable with toasted slices of whole-grain bread or a scoopful of scented jasmine rice. And then there was Sinfully Circles, a mirror-walled annex whose name tacitly acknowledged the temptations within: breads, pastries, cakes and chocolates of various shapes and flavors adding sweet, buttery, cocoa-licious insult to caloric injury. But I only had eyes for the kakanin, an assortment of traditional Filipino treats made with whole or ground rice. Between the gaily-colored mochi balls, the striking stripes of sapin-sapin, the deep purple of ube haleya and my absolute favorite, sweet-sticky-scrumptious biko (rice cake topped with latik, or coconut jam), I simply could not resist having dessert for breakfast every day. It proved to be my fall from grace. The restaurant's name, theme and much of the food were quite fitting for the upcoming New Year festivities as circles, spheres and rings are considered auspicious symbols of prosperity (coins) and completion (coming full circle), borrowed from Chinese tradition and incorporated into Filipino celebration. Although I grew up participating in these practices, I was surprised to find just how deeply ingrained they were: without conscious thought, I often found my plate filled with these lucky shapes. Less fortuitously, said plate was constantly full for the next 10 days as I made the seemingly endless loop from table to food stations and back again. By the time our stay at Shangri-La was over, my belly had taken on the soft, pillowy roundness of the freshly-baked pandesal I couldn't resist buttering each morning. Of the 4 pairs of jeans in my vacation wardrobe, only the spandex-blend pair still fit by trip's end. Thank goodness for loose tunics and black yoga pants - I would return home plump, yes, but at least semi-stylish. I knew better than to lose myself in a buffet, yet the will proves weak when it finds itself in a room filled with delectables crying out, "Eat me!" Like falling asleep in a fairy ring, entering the realm of all-you-can-eat can turn into a nutritional trap and much like a wicked spell, the lure of bottomless dishes is, according to behavioral researchers, powerful and subconsciously irresistible. But that's for my next post. In the meantime, let me leave you with the hint of hope that I found among the decadent food in Circles - Birchermüesli, a creamy concoction that made me feel indulgent yet faithful to my aforementioned morning mainstay of yogurt and granola. Though it didn't quite stem the overeating, it did help to bring me back down to earth. Never mind how it came to be that my first taste of this Swiss cereal dish was in the Philippines - it only matters that I did and that I love it! Also known as Bircher-Benner müesli, this luscious, healthy meal was the creation of Swiss physician and nutrition pioneer Maximilian Bircher-Benner (1867-1939), whose original recipe for a simple mixture of raw oats, apple and nuts soaked overnight in sweetened condensed milk and lemon juice has evolved over the years to become a worldwide breakfast favorite. Today, müesli may be readily found pre-packaged at the grocery store but can be made just as easily from scratch at home. These ingredients and measurements are flexible so feel free to substitute and to increase amounts as needed for the servings desired. In a small bowl, combine all ingredients (except apple and cinnamon) and stir until well blended. Cover with plastic wrap and refrigerate overnight. To serve, top with grated apple and a sprinkle of cinnamon. Sinangag (Garlic Fried Rice) from Joelen at What's Cookin', Chicago? This is why I pack lots of skirts and dresses- more give after I stuff my face full of yummy food. I don't remember seeing this place last I was there. I'll definitely ave to check it out with the fam next I travel home. That really was shangri-la. I'm soo jealous, you get to spend the holidays in the Philippines!! That Swiss cereal sounds great, esp with the addition of condensed milk. wow what a good spread of food! Lots of sashimi...bread...yum! What a gorgeous array of food. I wouldn't have been able to resist stuffing myself. We've been fans of museli since we visited Bavaria years ago. Your photo is drop-dead gorgeous. You've made museli look like a rock star. Wow. Wow! That's one amazing buffet! Sounds a little like me when I was on my honeymoon - I deliberately left the skinny jeans at home. Knew that wasn't gonna work! That's a food paradise! How could one resist such fine selection of food? ha ha "what goes around makes me round" oh true is that? love it! Wow, what a spread! I would've filled plates day after day too. Heh. You've done it now! We are going to go back and revisit muesli done the right way. We never would have had time to see the sights had we begun the day with breakfast there. What a beautiful experience, we took the kids for a traditional dim sum brunch a couple weeks ago, it was delicious! OMG! Everything looks absolutely wonderful. I can see why heaven can wait! Isn't it grand to discover wonderful food? Oh, dear--what a spread!! If I had been there, I'd probably still be eating. I've always wanted to spend the holidays in the Philippines. You were so lucky to have done so! I'll have to look into the Shangri-La next time I'm there. Welcome back! I do remember Filipino Hotel Buffets - no one does it quite like them don't you think? How I miss them - except for the consequences after! Thanks for your recipe too! Looks like good eats for a hotel. The selection is so varied! And this recipe would be great for a light morning breakfast. i hope you had a wonderful time in Manila! You has to go to Lolo Dad's in Makati City. You just has to. A little pricey but SO worth it. I'll post my visit up very soon but if you're still there, YOU HAS TO GO!!! All that food is one of the reasons why I try to save a trip to Circles for the more momentous events of my life. It's just too rich for everyday - but oh-so worth it, every single calorific bit of it! Wish you a Happy 2010 full of Birchermüesli and similar sweet ones! The muesli sounds delicious (and like what I usually have for breakfast), but I could have circled the Sinfully Circles all day! Sounds like an amazing buffet. My stars, what a glorious feast! Looks like you spent the holidays in fine, and delicious, fashion, Noodle! How lovely, indeed! This post made me SO HUNGRY! The descriptions were fantastic! Thank you all for your comments on my first post of 2010! Big Sis - It was so special! I wish the whole family could be together like that more often. Hope we'll be out Cali-way soon to see you all! Jenn - Definitely don't miss it! Perhaps you'll have a stronger will than me. Caroline - I am so grateful that we had this opportunity. My whole family was there, the first time in over 5 years! As for the cereal, I'm definitely going to try the SCM version but for now, I have to stick with yogurt - too much flub I have to get rid of! Pigpigscorner - The sashimi & sushi were great but I'm a carb girl so I stuffed myself silly with breads and cakes! Spud - Thank you! I barely escaped but I'm afraid to step foot on a scale to gauge the full damage. Sinful edibles are all well and good but meusli and yogurt are my best friends right now! Sam - And I couldn't resist! 8-) I'm happy that the photo shows even a smidge of how good Swiss müesli can be. This may have been one of my best souvenirs from the Philippines! Angie - It was a treacherous paradise . . . I loved every minute and bite! Dawn - It is so very, horribly, deliciously, mortifyingly, satisfyingly true! Yarntangler - I wanted to take a nap after breakfast each day! 8-) This Swiss-style müesli really is a treat - like having pudding for breakfast but ever so much healthier! Sarah - Thank you! I usually avoid buffets but am a big fan of dim sum. The difference, I think, is that in the former, all the food is out there, filling my vision, whereas dim sum trucks hide them. Out of sight, out of mind, off of hips . . . ! BCGW - Thanks! It has been a long while since I've last visited you - gotta see what you've been up to! OPC - If you'd been there, we'd both be having a grand ol' time! Happy New Year, dear friend! Marvin - Oh, I hope you and your family will do so! Last year was the first Christmas we spent in PI in 18 years and I'd forgotten how raucously festive it is. As for the Shangri-La, my mom booked the room & got a special rate for 'balikbayans'. If ever you make plans, let me know and I'll ask her about it! Trissa - I thought breakfast at my parents' had tons of food but I was so unprepared for the hotel buffet! Glad you liked the müesli. Duo - I've been sticking to this müesli and plain yogurt/granola since we've returned, hoping to undo the breakfast damage. Still, how could I possibly pass up on such a feast? MrsLavendula - This dish is definitely a breeze! We had a fantastic time in Manila and sincerely hope that we'll be able to return in the future! Gourmand Extraordinaire - I walked by Lolo Dad's on my way from the hotel to Glorietta nearly everyday! I kept wondering what it was like - we'll definitely stop in the next time. Thanks! Midge - If I'd known, I might have strengthened my will but I was caught off guard and that was the end of my thinner self! 8-) But I can't regret it. And I'm a bit envious that you can still go for your special occasions. Be sure to post pix for the next time so I can remember . . . ! Gera - I'm hoping all those lucky circles and round foods are an auspicious sign that my year will be filled with good luck! Thank you, friend! Danielle - Hello! I almost panicked when I realized that I had an old URL for you but determined Googling led me to your new site! I'm focused on organizing myself this new year so that I will be sure to stay in touch with my blog friends like you. Happy New Year! Teanna - I shouldn't look at the pictures anymore because I feel the familiar pull! Speaking of getting hungry, I saw you have a tres leches post up. Talk about wicked! I've deliberately waited until I'm full from dinner before I visit you. Karine - You're welcome! I truly fell in love with this dish from the first moment I tasted it. I love that it has both a creamy and crunchy texture, first from soaking in the yogurt and then from the nuts and fresh apple. I hope you'll try it for yourself! 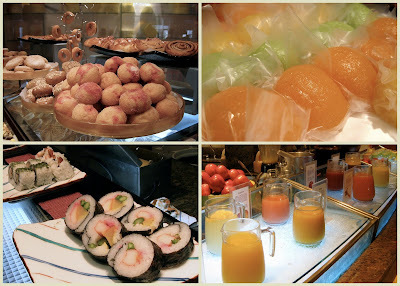 secondly, i'm very jealous... we'll try Shangri-La's breakfast next time! The choice is mind-boggling... i'll probably try to get up early and stay till they close just to make sure i've sampled everything! Looking forward to more post from/'bout Phils! Wow, what a fabulous feast! Getting hungry looking at it at midnight :) Will have to make your version of Birchermüesli in the morning, sounds so yummy! Thanks for the link. The food at Shangri-la was really a feast and we still go back every few months to have breakfast or even dinner. Hope to see you the next time you visit. Hmm, when would that be? Glad you enjoyed your stay here and you really deserve a break. At first look I tot it was Ice Kacang. Haha, but it's not. What fabulous food! Thanks for the recipe - we can have a little taste of your trip at home ;). 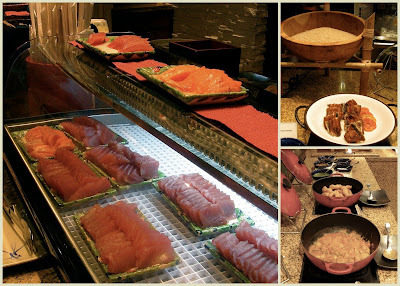 This post makes me miss all those buffets in the Philippines...always a delightful experiece as I recall--- the beautiful spread, the luxe dining interiors and the glorious food!!!! Oh my! Everything look just unbelievable delicious...really nice :-) Will definitely try the Swiss cereal dish! Always love reading your posts and great writing style!! What a scrumptious buffet spread. Hmmm ummmph! Beautiful place and all the wonderful cuisines. Eating there would be so fun and relaxing. Plump yet semi-stylish, haha, love it! What a recap. The food sounds amazing. I especially enjoyed the picture of the juices. That is one thing I do really miss about Brazil. Funny that you brought up the muesli because our first place to try the real deal was in SE Asia in KL. :) We've been hooked ever since and this one I have to try! 5 Star - I hope you do try the müesli. It's such a complete meal in a bowl and the varied textures are really quite satisfying! Divina - I wish I'd had time to hook up with you and other Manila bloggers! But you can be sure that I will let you know when we visit again (and I'm determined to return to PI soon!) I'd love to hear about your experiences at Circles, too! Maya - Thank you! I enjoyed myself tremendously. Happy New Year to you! Wendyywy - I love Ice Kacang! It's similar but different to Filipino halo-halo; shaved ice treats are so delicious, aren't they? Unplanned Cooking - Thanks! I hope you'll enjoy the müesli. I'm a bit embarrassed to have posted a 'recipe' - it's so simple! Casey - Thank you and welcome! The eats were all delicious, too. Rebecca - I've apparently developed a cast-iron stomach that I could merge all those different flavors together. On the other hand, it made me a wee bit overconfident over how much I could, and should, eat! Sook - Welcome and thank you for following! I hope you'll enjoy my future posts, though I sometimes run a bit behind. So glad you like the müesli - it's quite a treat! Lori - I need to follow in your running footsteps: I can not believe how quickly I could gain so much in just 2 weeks. And it seemed literally overnight (one day I could fit into my jeans, and the next not at all!) How funny that you're 1st experience with müesli was in Asian, too. I think we may be a bit too insulated here in America! Hope you enjoy it. just came across your blog through sophia's, and i must tell you that it's absolutely BEAUTIFUL and i love it! looking forward to reading more from ya. What a fantastic way to spend the holidays~ I'm still dreaming of a trip to the Philippines...someday. In the meantime, I will live vicariously through your travels---thanks for sharing with us! Oh, I'm a bircher monster. Love it, love it, love it. Always have a huge jar of homemade full and then.....heaven. Absolutely love your intro! Sorry for the late replies to your lovely comments! Moretolifethanlettuce - Thank you and hello! Sophia is an awesome blogger and I'm so pleased that we've connected through her. Erica - Thank you! It was indeed a feast but I didn't handle myself too well. Still, I enjoyed it with my husband and family so it wasn't all that bad. Well, I'll Be Jammed . . .